Denon HEOS review | What Hi-Fi? Denon might be best known for its Award-winning AV receivers and micro systems, but that’s not all it makes. The company has a wide range of products – from soundbars to subwoofers, amplifiers to wireless speakers – and all that kit can be connected up through its HEOS multi-room application. There’s rich competition in that market from the likes of Sonos, Bluesound, Audio Pro and others, so we picked up a pair of speakers – the hefty Denon HEOS 7 HS2 (£549) and the smaller, potentially portable Denon HEOS 1 HS2 (£199) – as well as the HEOS Link HS2 (£349) which lets you add your existing system into the mix, to test how well the HEOS system manages it all. In order to connect the speakers to your wi-fi network you need to load up the HEOS app and either plug an ethernet cable into the back of the product or use a 3.5mm jack to transfer data from your smartphone or tablet to the device. Flashing LEDs at the bottom of each product shows its condition – green during set-up, blue for a secure connection. The HEOS app quickly finds the music on our Naim servers, as well as offering to stream from Amazon Music, Tidal, Deezer, SoundCloud, Spotify, TuneIn, or play local music from our device or via a connected USB stick. An Alexa skill to let you switch source by vocal command is coming later this year. There’s Bluetooth too, although it lacks the aptX required for ‘CD-like’ 16bit/44.1kHz streaming. If you want to use multiple devices to control the products, we recommend creating a Denon account. This saves your various passwords, and quickly logs you into your accounts when you change to another tablet or smartphone. While Spotify works via Spotify Connect, the rest of the apps show up within the HEOS app itself. For the most part this is straightforward - the separation of products, sources and playback sections into tabs at the bottom of the app makes it easier to use than competing designs from the likes of Audio Pro. To send music to multiple speakers, just drag and drop them into the configuration you want. The range is capable of playing 24bit/192kHz music streams over a wireless network or via USB, and will support DSD up to 5.6MHz. The only slight downside is that the Settings panel is located within the Music section so, for example, if you are deep into the embedded Tidal app and want to change the device settings you have to tap all the way out. We’d prefer it to be a little more accessible. Although they are different shapes and sizes, each HEOS product feels well built. The HEOS 1 hides a tweeter and a mid/bass, while the larger HEOS 7 has two tweeters, two mid/bass drivers, a pair of passive bass radiators and a subwoofer, powered by a total of five Class D amplifiers. On the back of each speaker is the same smattering of connections: USB, ethernet and auxiliary inputs (the HEOS 7 comes with a headphone output too). There are also buttons for Bluetooth pairing and linking the products up with wi-fi. The Link provides a wide array of ports. As well as those found on the other HEOS speakers, it also has coaxial and optical outputs, a stereo pre-out and the option to connect a subwoofer. For inputs, there’s an optical connection and a stereo line-in for connecting sources such as a CD player. After leaving the system to run in a few days, we play a Tidal stream of I Am The Doctor by Murray Gold. 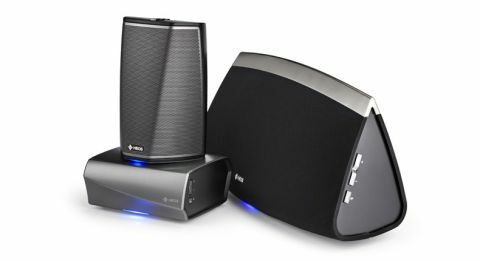 The HEOS system provides an impressive performance, one that’s easy to listen to. With smooth, high-pitched strings, a choir, rapidly plucked notes and the mighty bass that cuts underneath, a good system should keep it all in check and balance it accordingly. Both the big HEOS 7 and the little HEOS 1 do that, meaning you can listen to a range of music for hours without tiring of the speakers’ character. The HEOS 7 sounds big and spacious, easily filling our medium-sized testing room with a weighty, authoritative sound. If used in smaller rooms, Denon recommends going into the EQ settings and turning down the bass a little. We're inclined to agree. Meanwhile, the way it handles the vocalisations that rise up midway through the track is notably fluid. There’s enough attention to detail here to make out how the multiple voices are combined too. Moving to No One Knows by Queens of the Stone Age, played from our Naim music server, the system provides a solid punch and an impressive depth. At the end of the track, when earthy drumbeats are suddenly replaced by a lonesome, focused guitar riff, both the HEOS 1 and the HEOS 7 manage to convey the dynamic change well. We swap speakers to test out the Link, plugging it into our reference system and connecting it to the app. A blast of Max Roach’s Lonesome Lover provides a good test of detail thanks to the shiny cymbals - and the Denon handles the treble confidently, retaining its charm without erring on the bright side. The mash of trumpets, deep drums, and cymbals all keep their counsel well, too. But while smoothness, spaciousness and insight sound are all laudable qualities, the HEOS system lacks the rhythmic precision or dynamic subtlety of some rival kit, such as Audio Pro’s Addon C10 and C5 speakers. The HEOS system has more difficulty conveying the rising tension in Murray Gold’s scores, the quick changes in intensity and the texture of vibrating strings. The problem for the HEOS system is it doesn’t quite do enough to raise its head above the rest of the multi-room crowd. For example, Audio Pro and Bluesound both are better-sounding systems (despite Audio Pro lacking hi-res audio support), and Sonos offers a more thorough and pleasant user experience. This is a good system, one that does everything pretty well - but there’s not a truly compelling case to go the HEOS route over that of one of those rivals.